Oystershell Scale Eggs Are Hatching! 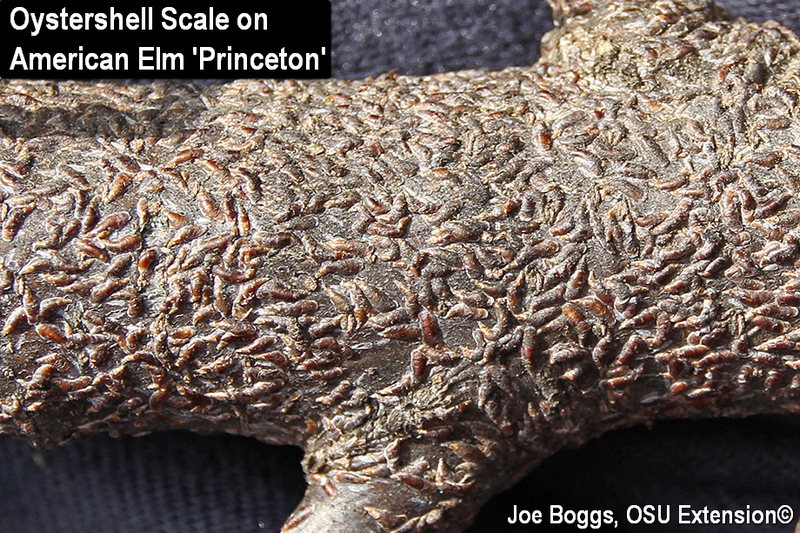 The overwintered eggs of Oystershell Scale (Lepidosaphes ulmi) are hatching in Ohio with first instar nymphs (crawlers) afoot in the southwest and northwest parts of the state. This is a critical event because the mobile crawlers are susceptible to a number of control options that are not effective against other scale developmental stages. Oystershell scale females measure no more than 1/8" in length. The scales resemble miniature clams or oysters owing to their elongate and slightly convex shape; thus their common name. Their small size, dark gray to brown color, and slight banding can cause the mature females to blend-in with bark making low populations difficult to detect. As with all armored scales, the oystershell scale feeds by inserting their piercing-sucking mouthparts into plant stems to withdraw nutrients from non-vascular stem cells. Since they do not extract juices from vascular tissue, oystershell scales do not exude the sugary, sticky "honeydew" that is associated with "soft" scales. Thus, black sooty molds do not develop to help disclose an oystershell scale infestation. The scale has a wide host range and may be found on over 130 host plants including trees as well as shrubs. Although this scale has only one generation per year in Ohio, undetected infestations can rapidly build within 1 to 2 years to levels that cause significant plant injury including branch dieback and even plant death. Oystershell scale spends the winter as eggs protected under the hard coverings of dead females. Eggs begin to hatch when Accumulated Growing Degree Days (AGDD) reach 497. Full bloom of Miss Kim Manchurian Lilac (Syringa pubescens) coincides with egg hatch making it a good phenological indicator plant. Two-sided sticky tape applied to infested stems is an excellent way to detect egg hatch. You should also reapplying the tape periodically because egg hatch can occur over an extended period of time. Clean tape will let you know when eggs have stopped hatching. Eggs can be destroyed prior to hatching by using a dish scrubbing pad to lightly scour heavily infested stems on small trees and shrubs. Removing and destroying heavily infested stems is also a recommended "first step" in an oystershell scale management program. However, both of these methods become less effective once eggs hatch and the mobile crawlers disperse. Dormant oil applications will fail to reach eggs beneath the dead females. However, horticultural (= summer) oils as well as insecticidal soaps are effective against the exposed crawlers. Keep in mind that multiple applications of these contact insecticides are required because eggs may continue hatching over an extended period of time; use sticky tape to monitor! Most topically applied insecticides sprayed onto infested stems will kill the crawlers. These include pyrethroid insecticides (e.g. bifenthrin, permethrin, etc.) and products based on other active ingredients such as carbaryl (e.g. Sevin), or acetamiprid (e.g. TriStar). Multiple applications may be required if eggs continue hatching past the time frame noted in the product's label directions for residual activity. Remember that these insecticides may also kill pollinators and other beneficial insects, so caution should be exercised to avoid exposure to non-target insects. The insect growth regulator (IGR), pyriproxyfen (e.g. Distance), provides another option. This IGR is highly effective against scale crawlers but gentle on beneficial insects including pollinators and natural scale enemies such as scale parasitoids. A number of systemic neonicotinoid insecticides applied as soil drenches are effective against soft scales, but some, including imidacloprid (e.g. Merit) and clothianidin (e.g. Arena) will not kill oystershell scale or other armored scales. Dinotefuran (e.g. Safari) is a highly soluble neonicotinoid insecticide that moves rapidly into plants and has been shown to be effective against armored scales as well as soft scales. Applications should be made after target plants have stopped blooming to avoid possible negative impacts on pollinators.